The all-in-one voice and text chat software Discord wants to compete with Teamspeak and Skype - is confirmed by the slogan "It’s time to ditch Skype and TeamSpeak". Discord convinces and leaves a great impression. Our Discord MusicBot can transform each Discord Server into a private radio station. In addition to playing self-uploaded music, the bot can also stream radios, YouTube videos and files from SoundCloud, Dropbox or direct links. All popular formats and codecs are supported. The MusikBot is managed by a separate web interface. A sophisticated user management with fine grained privilege control allows you to give out access to multiple users. Just create several bots and let them play for the different audiences. It can be controlled all bots from within the web-interface. You also don't need to re-upload files again, as files and users will be shared between the bot instances. 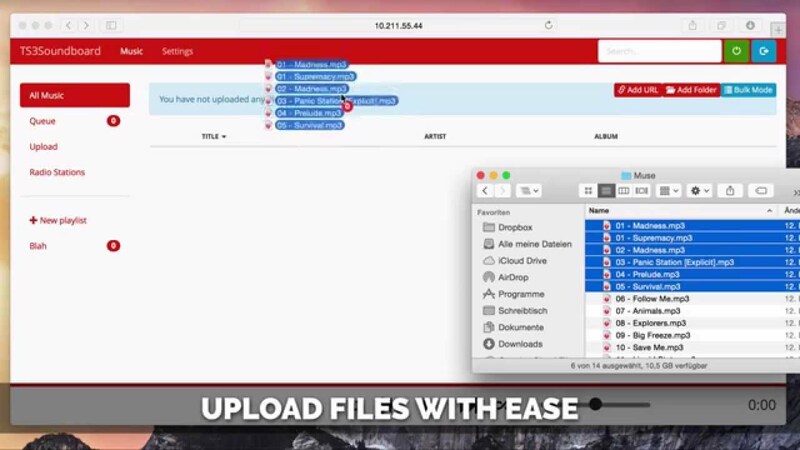 Uploading files is as simple as dragging them from your desktop to the browser. The bot has the great FFmpeg library, you can playback lot of audioformats (like mp3, aac, flac), even videofiles. You can download files from popular services (YouTube, Twitch, SoundCloud, MixCloud, ...) and listen to them. There's an integrated directory of radio stations that you can start with just a double-click or you can listen own url-streams. 1.Kann sich der MusikBot mit jedem Discord Server verbinden? Bevor Sie den MusikBot mit einem Discord Server verbinden können, müssen Sie bei Discord einen API-Zugang einrichten. Für die Autorisierung wird die Berechtigung "Server verwalten" benötigt. Wenn Sie den Discord Server erstellt haben, so haben Sie durch die Rolle "Server Admin" auch die notwendigen Berechtigungen. In den Produkt-Einstellungen finden Sie unseren Einrichtungsassistenten, der Ihnen in wenigen aber dennoch ausführlichen Schritten bei der Einrichtung hilft. 2.Können eigene Scripts im Interface installiert werden? Aus Sicherheitsgründen ist es nicht möglich, dass Kunden eigene Scripts installieren. TS3index.com stellt jedoch einige Scripts wie z.B. WelcomeSound bereit. Weitere Informationen finden Sie unter Alle SinusBot Scripts von TS3index.com. 3.Wann wird der MusikBot neugestartet? Ein Neustart der MusikBot, Sicherheitsupdates und Wartungsarbeiten am Server werden zuvor geplant und angekündigt. Einen regelmätigen/täglichen Neustart gibt es bei TS3index.com nicht. Es ist möglich, dass der MusikBot sogar mehrere Wochen oder Monate mit dem Discord Server verbunden ist sofern Sie selbst den MusikBot nicht neustarten oder der Discord Server die Verbindung trennt. To simplify the operation of the bot from a Windows PC, we've created the TS3index.com Bot-Manager. The Bot-Manager is a widget that docks to your TeamSpeak 3 Client and so becomes the perfect companion for quick access to one or more TeamSpeak 3 MusikBots. You can only use the TS3index.com Bot-Managerr with the TeamSpeak 3 MusicBots of TS3index.com. The Bot-Manager requires the Microsoft Framework 4.5. A big thank goes out to Michael Friese for creating the bot. We can proudly say that TS3index.com was the first hoster for his SinusBot. TeamSpeak 3 MusicBot, TeamSpeak 3 Server, TeamSpeak 3 ControlBot und TSDNS-Domains.